2015 Women’s World Cup TV ratings preview extravaganza! We’re really looking forward to the start of the 2015 Women’s World Cup and like most people around here we’re draping ourselves in the flag and rooting for the United States Women’s National Team. Here in the United States the games will air in English on the Fox broadcasting network, Fox Sports 1 and Fox Sports 2. In Spanish they’ll air on NBC Universo and Telemundo. Here’s an in-depth look at Fox’s broadcast coverage plans from Sports Illustrated’s Richard Deitsch. We’re also rooting for some good ratings, not just for USA’s matches, but overall. But clearly, at least if past history is any guide, the barometer for the U.S. media will be how the matches involving the USA do. There’ll be even more focus on this than usual because the coverage has switched from ESPN to Fox’s broadcast and sports cable networks. 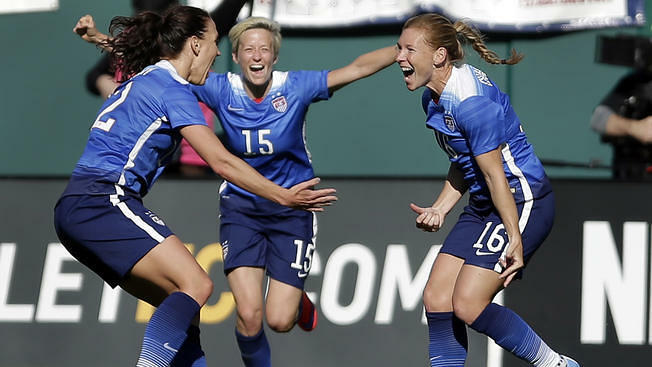 There are several difference in the landscape versus the 2011 Women’s World Cup The tournament is starting a few weeks earlier than in 2011 and we don’t think that’s likely to make much of a difference as far as the ratings. But there are a couple of differences which will impact the ratings, potentially by a lot. 1. Unlike ESPN, which aired all of the games on ESPN, i.e. they didn’t air any games on their sister ABC broadcast network, Fox will be airing games on its broadcast mothership. Two out of three of USA’s group stage matches will air on the Fox broadcast network. *the Fox broadcast network mothership is in roughly 27 million more homes than Fox Sports 1. 2. The 2011 games were in Germany, 6 hours ahead of New York. That means the games that were played during prime-time in Germany aired 6 hours earlier than prime-time in the U.S. One of the USA’s group stage matches at least aired on a Saturday in 2011 and none of the USA’s group stage matches this year will be on a weekend. But all three of the USA’s group stage matches will air during primetime on the east coast, and two out of the three will air on the Fox broadcast network. Forgetting about whatever anyone thinks about how far soccer has come in the United States, even thinking about it in terms where it’s on exactly the same footing as it was in 2011, we think Fox should (and will) do at least a little bit better versus 2011. Obviously Fox can’t control how far team USA advances through the tournament. Ultimately if the USA exits before the final, the tournament won’t compare that well with 2011. But during the group stage, we think Fox will (and should be) disappointed if it can’t better ESPN’s results in 2011 by at least a little. Sure, that first match against Australia on Fox Sports 1 will be in ~10 million fewer homes than ESPN, but we think the time zone benefit should offset that. The other 2 matches will be on a network with more coverage and in more favorable time zones*. *If you want to argue the Saturday game during the group stage in 2011 was pretty time-zone friendly, we won’t argue with you. For those who love soccer more than ratings (which we’d guess is, smartly, most of you) the overnight rating is the household ratings (percentage of households who watched) in the top 56 markets – we only included those numbers for the first game and the final. The HH (household) rating is the national rating — the percentage of households tuned in in all 210 markets. Viewers = average viewership across the entire telecast and not the total number of people who watched any portion.